A stern yet benevolent organizer who often knows best, my wits are keenly fixed on aiding efforts I deem worthy. Peter's role back on earth grew as the war with the Formics ended. When Valentine left with Ender, he was the sole mind behind both Locke and Demosthenes on Earth, and he continued to influence public opinion with the personalities. Eventually he declared that indeed he was behind the writings of these two pen named philosophers. He was subsequently elected Hegemon. Bean: orphan. was made in an experiment which was to change a gene in him which enables him to continually learn things at an incredible rate, with the payoff being that he will lead an incredibly short life, but will be super smart. he lacks a lot of human emotions and but has been taught how to "feel" by those close to people. Uh, Locke, the quiz picks your charactor. You don't pick it yourself. A mastermind of maneuvering surrounding forces, you care little for the concerns of those in your way. Hmm not exactly sure how I got this title. 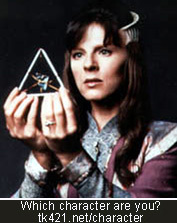 Delenn is a character in the Babylon 5 universe. Ha ha ha! I'm Galadriel too! No wonder Charge and I get along so well!